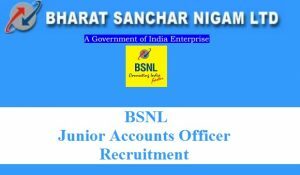 Bharat Sanchar Nigam Limited has released BSNL JAO Recruitment 2017 for 996 Junior Accounts Officer Vacancies. So, Candidates who are interested can apply for this BSNL JAO Recruitment 2017 before the last date. Aspirants can submit Online BSNL JAO Application form starting date onwards i.e 11-09-2017 through the official website provided below. Before applying for BSNL JAO Vacancy 2017 candidates must check the BSNL JAO Recruitment Notification 2017 and BSNL JAO Vacancy details clearly. Here, we have provided all the details of BSNL JAO Recruitment 2017 in the following sessions. The vacancy details of BSNL JAO Vacancies have mentioned in the above table. So, candidates can grab this opportunity by preparing well for this BSNL JAO Exam. Here, we will also provide BSNL JAO Syllabus and BSNL JAO Previous papers PDF in the below sessions. BSNL has released 996 Junior Accounts Officer Vacancies. So, candidates who are interested in Central government jobs can grab this opportunity by applying to the BSNL Junior Accounts Officer vacancies. The complete details of BSNL JAO Recruitment 2017 have mentioned in the above table. Candidates are advised to check the BSNL JAO Recruitment 2017 carefully before applying for BSNL JAO Vacancies. Aspirants can apply for BSNL JAO Vacancies through the online mode. The exam date for BSNL JAO Exam is 5 November 2017. So, prepare a neat time table for BSNL JAO Exam and start preparation by covering all the important topics from BSNL JAO Syllabus. The important Dates for BSNL JAO Exam 2017 are mentioned in the above table. The BSNL JAO Examination dates are very near. So, we suggest all the candidates start the preparation as early as possible. Here candidates can download BSNL JAO Previous papers by clicking on the links provided below. Minimum Age limit for BSNL JAO Recruitment 2017 is 20 Years. Maximum Age limit for BSNL JAO Recruitment is 30 Years. Age relaxation will be based on BSNL JAO Rules and Regulations. Candidates who are applying for BSNL JAO Recruitment 2017 must possess the M.com /CA /ICWA /Cs from any recognized institution / University. The selection process for BSNL JAO Recruitment 2017 is as follows. The BSNL JAO job offers pay scale of Rs.16400/- to 40500/- per month. Click on BSNL JAO Recruitment Notification 2017. Check the BSNL JAO Notification carefully. Now Apply for Online for BSNL JAO Notification 2017. Fill the BSNL JAO Application Form with correct details. Finally, Submit the BSNL JAO Application Form. Now take print out of BSNL JAO Application form for future use. Book Mark our website Recruitment Hunt regularly for more latest updates regarding all other Government Jobs.